With decades of experience, BLACK KNIGHT RETAIL SYSTEMS LLP offers a variety of point of sale systems. In addition, we provide extensive repair services. Our POS rental services are ideal for events and pop-up businesses. We also provide the consumables your devices require at truly affordable rates. We’re proud to offer such an exhaustive selection of high-quality products, all produced by leading-name manufacturers. Browse our products today! In addition to POS systems, we supply essential commercial equipment. These products help companies to conduct business smoothly. Contact our point of sale suppliers, in Milton Keynes, Buckinghamshire, to discover the best-in-class POS systems we provide. For more than 35 years, BLACK KNIGHT RETAIL SYSTEMS LLP has supplied dependable, affordable POS systems. Based in Milton Keynes, Buckinghamshire, our point of sale suppliers have delivered a wide variety of systems for clients within retail, hospitality, restaurant, takeaway, and pub environments. 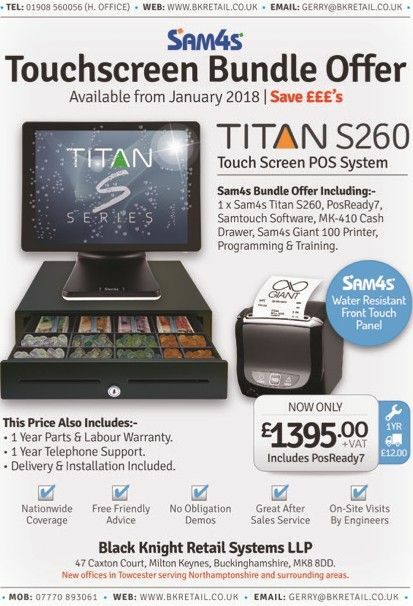 Tills are available from as little as £120, and extend to some of the most advanced, top-of-the-range products available. We provide our customers with constant support via a 24-hour telephone line. In addition, we’re equipped to carry out repair and maintenance services with minimal delay.